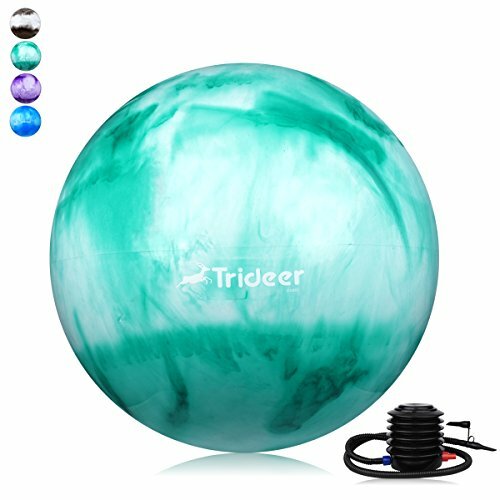 Trideer ball is very versatile. You can use it as part of your Yoga, Pilates. By using our ball you will be helping your body feel and perform better. Our balls are used in many areas of sport and daily life. The balls afford an important role in the treatment of back problems and the gentle muscle building in the area of physiotherapy. A targeted workout with a gymnastics ball replaces the visit to the gym in many cases. 2. The main focus of the training with gymnastics balls is in the body core. This mainly consists of the deep abdominal, back and pelvic floor muscles. In the "wiggle" on the ball, a whole-body training takes place, which stresses its entire musculature and at the same time spares its joints. - Allow Ball to reach room temperature before inflating. - Insert the pump into the ball's air valve and work the pump, airing up the ball. - Stop inflating when the ball reaches the level of the mark. Do not over inflate. - Remove the valve stem cover with the plug puller that came with the exercise ball. Twist the valve back and forth in an upward motion until the valve is fully removed from the ball.